Some of the earliest works touching on the subject of space travel came during the scientific revolution with "The Dream", written in the 1620's by Johannes Kepler, that described the view from the moon back to earth after a student of Tycho Brahe had been transported there by occult forces, and in "Gulliver's Travels" Jonathan Swift wrote about the moons of Mars which had yet to be discovered. When Mary Shelley's "Frankenstein" was published in 1818 the mad scientist entered the world of science fiction, she also wrote several other novels that formed the genre and came up with the concept of cryonics. 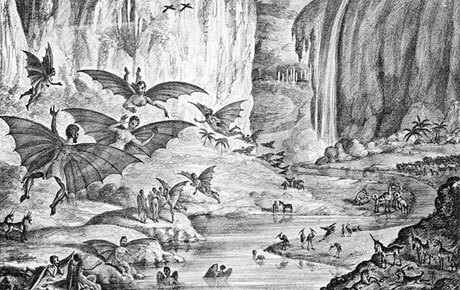 In 1835 a series of hoax articles were published in the New York Sun claiming that a civilization had been discovered on the moon by means of telescope where bat-like winged humanoids "Vespertilio-Homo" resided, surrounded by vegetation and water. As new technologies emerged during the second half of 19th century such as electricity and powered transportation science fiction as a genre became widely popular, this is when H. G. Wells and Jules Verne became the world's first full-time science fiction novelists. The genre of science fiction in film came at the same time as the motion picture itself at the turn of the century. In Europe French illusionist Georges MÃ©liÃ¨s , known as the first "Cinemagician", was innovating in the use of special effects with the aim of transforming reality through cinematography. His Star Film Company produced hundreds of films in the period 1896 â€“ 1913, many of them were just a few minutes long and focused on presenting new illusions rather than stories. 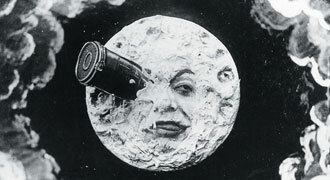 The most famous film by MÃ©liÃ¨s, also the world's first science fiction film, was "A Trip to the Moon", a silent black and white short from 1902. With the plot centered around a group of astronomers making a return-journey to the moon it was loosely based on two very popular novels of the time: "From the Earth to the Moon" by Jules Verne and "The First Men in the Moon" by H. G. Wells. The film made innovative use of MÃ©liÃ¨s special effects such as the stop trick he'd discovered by accident a few years earlier while filming street traffic, where people disappeared on screen. To get the effect MÃ©liÃ¨s would set off smoke in front of an actor while the camera was running, then stop the camera and move the actor out of frame and restart the camera, thus giving the illusion the actor had vanished in a cloud of smoke. This might not sound remarkable today but as it could also be done to make objects reappear or transform without the presence of smoke simply by stopping and restarting the camera, which was not possible in traditional theater, this helped give film an edge and a sense of spectacle which was important to establish it as a medium in the early days. A similar film based on another Jules Verne novel "The Impossible Journey", which depicts an expedition to the sun, was made two years later in 1904. In his films MÃ©liÃ¨s came up with other tricks such as dissolve and double-exposure which are still in use today and made him known as the father of special effects. He owned a large collection of automata, mechanical dolls made out of complicated clockworks that could do things such as dance or draw, which were being produced by many small family companies in Paris at the time. The word automaton became displaced by robot, which entered the English language as well as science fiction in the 1920's and came from a Czech play by Karel Capek called R.U.R. - Rossum's Universal Robots. The play, centered around a factory that made artificial people, became a huge success and within two years of its premiere in 1921 it had been translated into 30 languages, it also became some of the first televised science fiction when an adaptation by the BBC was broadcast in 1938. In Czech language the word robota meant serf labor, and the robots in the play were not mechanical devices that resembled humans like the modern robots we see today, but rather biological, human-like entities. The world's first robot seen on film appeared in German Expressionist film "Metropolis" in 1927, this was also the first feature length science fiction film produced in the west. Made in Berlin during the Weimar Republic years it tells the story of a future urban dystopia in the year 2026 where humans have been divided into two groups - workers who dwell underground and operate the machinery that runs the highly modernized city above ground where the wealthy industrialists live. 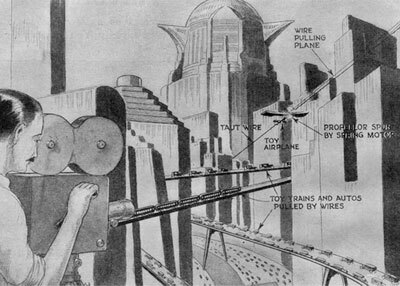 As the most expensive silent film produced in its time it pioneered many special effects, impressive miniature sets of the city were made and a new technique called the ShÃ¼fftan process was popularized, where actors were inserted into the shots of the miniature skyscrapers and other models with the help of mirrors. This technique dominated during the first half of the 20th century until it was largely replaced by color keying and matte paintings. 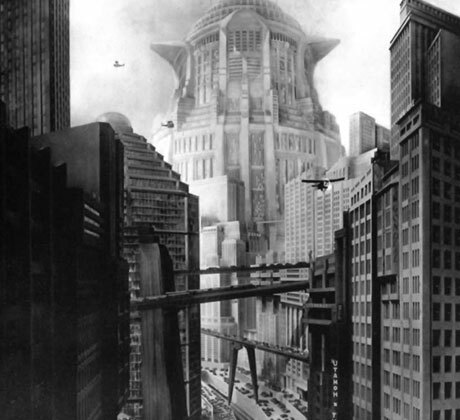 The city of Metropolis was a futuristic version of New York with set design showing off a wide range of environments, from the art deco style popular at the time to ancient catacombs and Gothic cathedrals. Many biblical references occurred in the film with the Tower of Babel being the center for the wealthy industrialists. For the first film robot, referred to as the "Machine-Man", a whole body cast was taken of the actress and the costume was then constructed around it like body armor using wood putty and spray paint to give it a metallic finish. Initially beaten copper had been considered but it would have been too heavy. The likeness of lead character Maria was transferred over to a robot by a mad scientist in a famous scene that became one of the most imitated in film, using silhouette cutouts and multiple exposures to get animated glowing rings to appear around the robot. The script was co-written by Austrian born director Fritz Lang and his wife Thea von Harbou and two years later in 1929 they went on to make another important science fiction film -"Woman in the Moon" - which was the first film that seriously presented space travel and the use of a multi-stage rocket to the public. Space travel and rocketry had been gaining popularity in Germany since the publication of "By Rocket into Planetary Space" in 1923, the dissertation of Hermann Oberth - a founding father of space travel. Him and a group of other German rocket scientists came together as expert advisers on Lang's film, they were working on a rocket launch for the premiere as well as constructing the props seen in the film, and although the publicity stunt with the rocket never came to fruition they formed the Society for Space Travel where they conducted rocket experiments prior to World War II. Many of these scientists went on to working on the rocket program under the Nazi regime and the building of the V2-rocket, of which the first one to fly had the logo from Lang's "Woman in the Moon" painted onto the base. The film also introduced the countdown to zero before a rocket launch, going from 10 down to 0. Fritz Lang, who was of Jewish origin, left Germany after the Nazi party came to power along, while his soon to be ex-wife became a member of the Nazi party and made her career in the propaganda influenced German film industry. Their films are typical of German Expressionist cinema between the world wars, which was influenced by the horrors of World War I, as well as showed signs of what was to come. Just like Lang who continued in Hollywood after he emigrated, many German scientists would end up in the USA after the war working for NASA on the space program and as expert scientific consultants in the film industry. In the 1930's sound film became the new medium allowing filmmakers to make use of dialogue, the Great Depression also led to the rise of low-budget serials with adaptations of comic strips like Flash Gordon and Buck Rogers. This time period in the 20's and 30's is known as the pulp era, the name came from the pulp magazines that were sold from the late 1800's up through the 1950's. These cheap entertainment magazines served as an important outlet for science fiction writers, and in 1926 the first dedicated science fiction magazine "Amazing Stories" was started. The publisher was Hugo Gernsback and over the next decade his magazine would help science fiction writers and fans to get in contact and form dedicated groups in the USA. This, along with the technology developed during the war, contributed to the golden age of science fiction which was to come in the 1940's and 50's, where special effects and space film made huge leaps forward.